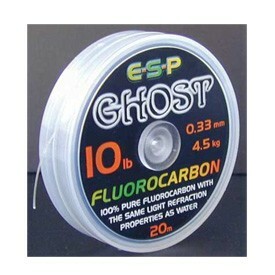 ESP Ghost Fluorocarbon - Available in: 10lb 4.5kg 12lb 5.5kg 15lb 6.9kg 18lb 8.2kg - Pure fluorocarbon not just a fluorocarbon coating. With the same light refractive index as water ESP Ghost is virtually invisible when submerged. Specific Gravity (SG) of 1.78 ensures rigs sink quickly and lie tight to the bottom. - An excellent hook link material particularly for wary carp in clear water.